Fiberscopes one of the types of inspection tools used in the Remote Visual Inspection (RVI) industry. Typically made from fiber optic or glass cables, the user will most likely look through an eyepiece to view the inspected area. 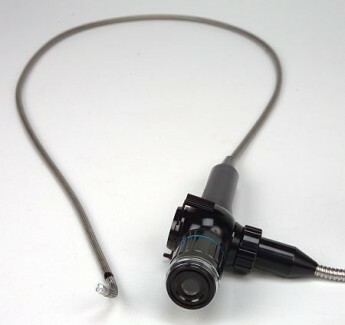 Since Fiberscopes do not utilize video capture technology, the user is relying on the fragile cables in the Insertion Tube to provide an image. The downside of this is that Black Dots or Broken Pixels are common. Much like televisions or monitors with dead pixels, after repeated use, the image in the Fiberscope’s eyepiece can start to have small black dots and can even obstruct the view of the inspection. Fiberscopes can provide a cheaper alternative to other visual inspection tools but also lack video and image capture, have lower image quality, and can quickly degrade from use.